If you use a hand-held microphone in your act that you need a Hands-free. No performer should be without this versatile microphone holder. This device is worn around your neck. The Hands-free adjusts so the microphone is kept at exactly the right distance. 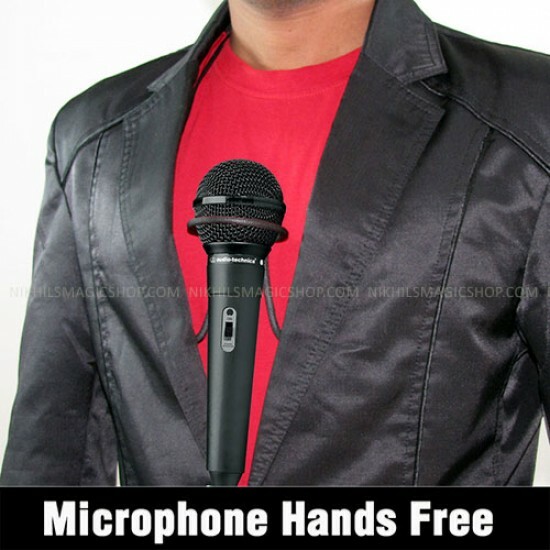 A must for any performer who wants to take a mic out of the stand and still have both hands free. The the three-point base hold it slightly out for better sound pick up. It is shown here and with a mic. Fits both regular and wireless mics. The LINKING RINGS or CHINESE RINGS is one of the finest effects of Magic. Several magicians have made their reputation with this classic trick. The b.. Performer, at any time during their act, can add a magical touch with this Instant Appearing Tie effect!Performer comes out dressed in a jacket an.. It is the most classic magic umbrella changing. It will instantly conjure up an umbrella after the newspaper tearing. The effect is great!Magic N..